For today, it’s London, looking like a throwback to the early days of Doctor Who. One of my most enduring memories as a kid was seeing the Daleks rolling across Westminster Bridge .. and I was determined to go there one day, to make sure that the Doctor had truly removed all trace of the evil mutants. This particular stretch of the Thames River has been used for so many TV shows over the years – and while this image was actually shot in 2010, it looks like it could be from 60 years earlier. The Westminster Bridge here is actually the oldest road bridge across the Thames in Central London – dating back to 1862 in its current form. There have been plans for a bridge here as early as 1664 – but it was nearly 100 years before a bridge was built – and it was then replaced a century later with the current structure which opened nearly 30 years before the iconic Tower Bridge. As for London Bridge (of ‘falling down’ fame), the first bridge was probably built about 3km downstream of what would become Westminster, around 50AD. It was destroyed and rebuilt many times until the famed ‘Old London Bridge’ was built around 1200AD. It remained until it was replaced in the 1830s (about 30 years before the Westminster Bridge). So if it was built before Westminster, why isn’t London Bridge the oldest road bridge in London? Because in the late 1960s, the ‘new’ bridge was sold to an American, who had it shipped brick-by-brick to the Arizona desert – where it remains a major tourist attraction to this day! Now here’s a ‘pop quiz’ … Is Westminster Bridge painted green, or red? 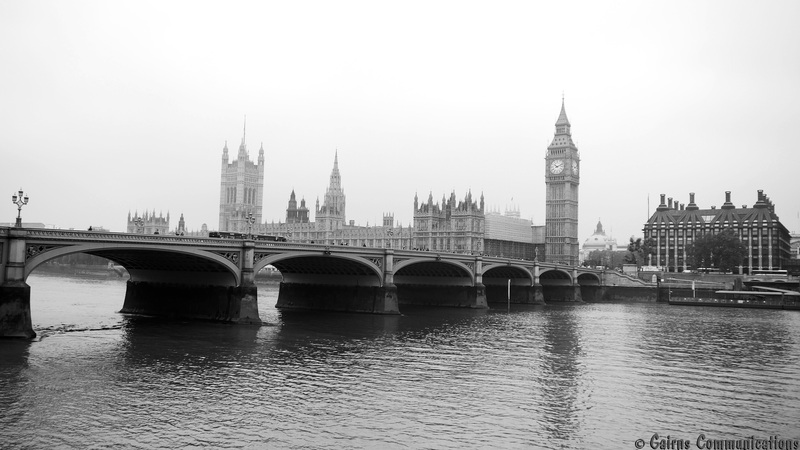 Because today’s pic is black and white you can’t tell, but if you know your Parliament, you might be able to guess. The House of Commons is at the right (or northern) end of Westminster Palace, while the House of Lords is at the left, or southern end.